Even though Cracker Jack the caramel coated popcorn and peanuts treat has been around for over 100 years the prizes did not appear until 1912. The original business would have to have commenced in 1872 by William Brinkmeyer a popcorn and candy manufacturer. The business was then purchased by Francis William Rueckheim. He brought his brother Lewis into the business as a partner and the firm was named F. W. Rueckheim and Brother. The big event that started the business onto success was the World's Fair of 1893 in Chicago - the Columbian Exposition. World's Fairs were becoming famous for introducing new products to the buying public. From ice cream, ice cream cones, hot dogs and in 1893 a caramel coated popcorn, peanuts and molasses kernel product. At first it did not have a name, but the millions that attended the Columbian Exposition in Chicago, love it. In fact one of the slogans came from a customer that stated: "The more you eat, the more you want". Then in 1896 a salesman eating the product was heard to state that "That's a Cracker Jack" the slang term for something great, terrific. Another piece of the marketing strategy had fallen into place.One problem to be solved was the way that the product although excellent would stick together. In 1896 a new member joined the firm H.G. Eckstein who developed the famous wax sealed package that most of us have come to associate with Cracker Jack. In 1902 the company was reorganized and became the Rueckheim Brothers and Eckstein. In solving the freshness problem with the wax coated box a large avenue of reaching the public was opened. In 1902 Cracker Jack was featured in the Sears catalog which meant that even individuals without access to a large city grocery store could order the product through the catalog and when it arrived it would be fresh. The arrangement was due to the fact that the Cracker Jack plant and Sears were located in Chicago. The product could go straight from the plant to the Sears warehouse and distribution centre. In 1908 another piece fell into place in connection to the new popular song "Take Me Out To The Ball Game". A song still heard today, especially at Wrigley Field in Chicago. "Take me out to the ball game buy me some peanuts and popcorn too". 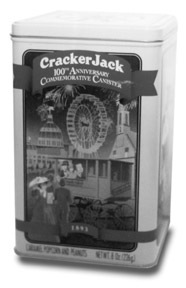 But, one of the final pieces of what we associate Cracker Jack with did not happen until 1912. Checkers an early competitor with a popcorn confection product was including prizes in its boxes. Prior to 1912 Cracker Jack boxes contained coupons which could be redeemed for various types of premiums offered by the company. Also there was from time to time a prize, but not on a regular basis. In 1912 Cracker Jack began to put not only prizes in all the boxes, but to increase point of sales and bring in return customers by having the prizes in series. If one looks at the history of the prizes Cracker Jack has always employed prizes in a series. The customer then continues to purchase for like any series or set one wants all of them. Eventually Cracker Jack overtook Checkers in sales and then purchased the firm. Due to increased sales a factory was opened on the East Coast in Brooklyn, New York in 1914. Of course I am sure that looking at the Cracker Jack package front and centre is Sailor Jack and Bingo his dog. But, what we associate with Cracker Jack - Sailor Jack and his dog Bingo did not appear on boxes until 1918. One source indicates that Sailor Jack did appear on advertising material in 1916 and the model employed was the grandson of F. W. Rueckheim. But, another source indicates it is connected to the Navy in World War I. Notice the snappy military salute that Jack gives on each package. Part of the joy of researching companies is the wealth of different information on how an item became part of the brand was invented and when. Then in 1922 the Rueckheim Bros. and Eckstein became just the Cracker Jack Company. It remained that way until 1964 when Borden purchased the firm and then sold it to Frito-Lay in recent years. The joy and difficulty in collecting Cracker Jack prizes is that many of the prizes are marked Cracker Jack or with the name of the company that manufactured the prize, but other prizes have no markings at all. The company did not employ one company over the years to manufacture the prizes, but many different ones. Some companies for one item or an entire series. So it is difficult to really have every item manufactured. Information is that the head office in Chicago has kept every item manufactured at least one in a vault for safe keeping and historical purposes. Several keys can be employed to attempt to date the toy and when it may have appeared in the Cracker Jack box. From 1912-1925 "A Prize in Every Box," from 1925-1932 the toy became a novelty and from 1933 onward it was a toy, and today it has reverted back to prize. The first early prizes were made of wood, metal. clay, tin and lithographed paper. Later prior to World War II and into the start of the war items were made of metal. Plastic appeared shortly after the war as it had become the "hot" new material. Also there were millions of pounds of scrap plastic that could be recycled from the war effort. In the 1960's paper began to appear and the items have become more "safe." The item can be looked at in terms of determining its time period by what was happening in society. Many of the items of the 1930's were connected to mysteries—due to the era of the radio listener. During World War II many items were placed in the boxes of a propaganda nature connected to the war effort. In 1941 and 1942 a "Keep Em Flying" item manufactured by the COSMO Manufacturing Company was in the boxes. It was a tin litho blow spinner. On the spinner are the words: "Let's Go US" and "Keep Em Flying." Aircraft are pictured on the round object and when blown the aircraft appear to be flying. The entire item is 1 3/4". 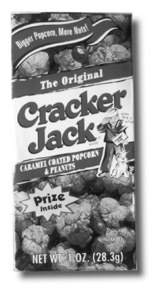 In Canada Cracker Jack was manufactured under license by Walter M. Lowney Co. of Montreal. A series of 50 aircraft picture cards was distributed during World War II. Card #45 pictured the Supermarine "Walrus" aircraft. The front of the card has a beautiful coloured painting of the aircraft flying above the clouds. The back of the card gives a full description of the aircraft including its airspeed and range. 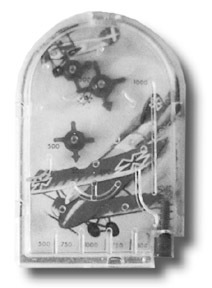 Due to the popularity of the item a second set of cards was issued entitled: United Nations Battle Planes. 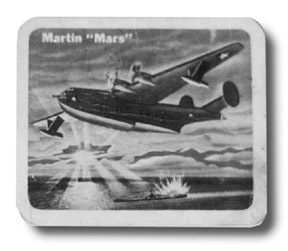 Card #103 features the Martin "Mars" flying boat. On the front the "Mars" has just bombed and hit an enemy submarine. On the back of the card explains that it is the largest flying boat ever built and can carry 150 fully-equipped troops and has the aircraft range to reach Europe. The cards measured 3" x 2 1/2". Cracker Jack has maintained its connection to baseball through the years in issuing cards and figures. Probably the most valuable complete set of baseball cards was the 1914-15 set of Cracker Jack Baseball Players. Some of the most collectible players in the set include: Shoeless Joe Jackson - who would be in the Baseball Hall of Fame except for the Black Sox World Series Scandal of 1919. Others in the set, Honus Wagner, Frank Chance, Ty Cobb. The cards measured 2 1/4" X 3". The 1914 set of 144 players is the most difficult to secure - all the cards only came in the Cracker Jack boxes. The 1915 set of 176 cards could be secured by mailing in one coupon and .25 cents. The company did issue a miniature set of some 24 of the players in 1993. The boxes featured a picture card on the outside of the box. Other sets of cards have been ordered through the mail and arrived on full size uncut sheets. One such set was issued in 1982 and included Willie Mays and Mickey Mantle. Baseball spy glass issued 2000. Includes warning: "Don Not Look Directly Into the Sun"
One baseball piece issued in 1950 - 1952 has special significance. It was manufactured by the S.P. Eisner Company and became so popular that it was placed in packages for three years. Usually prizes have a short run period and when exhausted no more are ordered. The player stands almost 2" and of course reaches back with his stance and uniform to the "Golden Age of Baseball" after World War II. It has been reproduced into a giant replica and is one of the centrepieces of the Cracker Jack Exhibit at the Centre of Science and Industry in Columbus, Ohio. The display features Sailor Jack and Bingo and advertising and prizes. Located in Columbus the former headquarters of Borden. Between 1933-36 over 200,000 kids mailed and joined the "Cracker Jack Mystery Club." Coins of the Presidents were hidden inside the boxes of Cracker Jacks. There were in total 132 million coins issued. One became a member by mailing back to the company 10 coins later in the depths of the Depression reduced to 5 coins. The coins were cancelled and one received a certificate of membership. The certificate featured Jack the Sailor Boy, Grand Magician. One was entitled to rights and privileges. In the 30's-50's kids existed just to join the various secret clubs and societies. Anyone that has watched the Christmas favorite—"A Christmas Story" knows of what I speak. In actually every item that was issued by the company could be considered unique. To educate kids in the 1930's and early 40's eight page drawing books were placed in some of the boxes. Produced by the Apt. Litho Company each book was 1 1/2" x 2 1/2" and contains 8 small pages to colour or to trace various figures that were in the little books. In 1934 keeping with the mystery theme a Mystery Picture of John Paul Jones was inserted. Manufactured by the Gensburg Manufacturing Company the card was 2". There was a series of three which included Teddy Roosevelt, and Abe Lincoln. If one followed the detailed instructions on the back of the card, the viewer could witness a "negative" afterimage of the portrait. One was to stare at the centre of the picture for about 45 seconds then turn to a light wall or if outside the sky and the likeness should reappear before one's eyes. This set of cards is not marked Cracker Jack. In the early 1950's games were a big item and in the later part of the decade space objects were important as items. The company has always attempted to maintain its prizes or toys in the realm of what is popular—hence the reason that material from Cracker Jack is so collectible. In 1958 and 1959 a set of ten figures were made by the NOSCO Plastics Co.—a division of the National Organ Supply Company. The figures standing 1 11/16" represent 9 different space figures—spacemen and aliens. The l0th figure in the set is the one that is difficult to find and sought by collectors. It is Sailor Jack and Bingo. In the 1980's a large "Mission to Mars" space game was inserted not into the boxes, but large tubs of Cracker Jacks. For in the 1980's the Bordell company placed the caramel candy and peanuts in large white tubs. The space game had a game board when folded out measured 7 1/2" X 12". The figures were 3" X 3 3/4". For many collectors the prizes or toys are important, but also is the advertising and material connected to ads and even the older boxes still filled with Cracker Jacks and the unknown prize. Cracker Jack has always advertised and one of the mediums employed in the early years was in boy's magazines. What better place to interest a kid than seeing a giant sized ad in a magazine. The November 1920 issue of Youth's Companion had a great ad. "When you've got to study at home at night". "A cold winter's night; ten math problems to do; three pages of history to study and on the table a box of Cracker Jack to your brain clear . How you wiz through those problems. How you memorize those history dates"! "Those crisp, delicious kernels of popcorn and roasted peanuts all covered with old-fashioned molasses can actually make it fun to study at home". In another ad in American Boy - a coupon was included to mail away for set of Akro Agate marbles. The ad featured a boy shooting his shooter marble into a pile. In 1955 with the Baby Boom in full swing - the first Cracker Jack on television appeared on the show CBC show "On Your Account" and was broadcast on 130 stations nationwide. 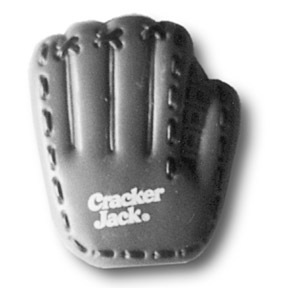 In 1999 Cracker Jacks ads appeared on the Super Bowl football game. For those that are interested Cracker Jack - Sailor Jack and Bingo appear on their own website. www.crackerjack.com A brief history is listed and there are contests and even a magic area. 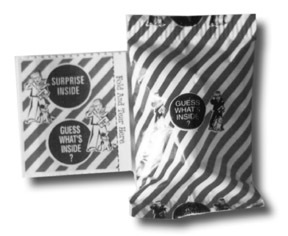 A large part of Cracker Jack history is connected to various mystery toys and prizes over the years and the company still continues in that tradition. Once on the Cracker Jack site there are links to take one to the Cracker Jack Collectors Association. This site is full of information on new items, old items, history and when the annual meeting is to take place. A second site has about 50 different items pictured and by clicking on - one can see a description of when the item appeared in packages of the product. In addition if the manufacture is known - information connected to it.